Who is the Main Member? The Main Member is the person or entity that officially registered either online or via a faxed application form as a Home911 member. Normally it would be the head of a household or business. Who are the Household Members? ANYONE connected to the Main Member's physical address registered on the Home911 system… Mom, Children, Gran, Granddad, Helper, Staff, Workers etc. Up to 10 ‘Household Members’ can be registered by the Main Member, all at ZERO additional cost. Who are your 10 Alert Recipients? ANYONE who you would like to alert when you (Main Member) or any of your registered ‘Household Members’ face a high-distress crime/emergency situation. Circumstances vary but your Alert Recipients would normally include the Main Member, Household Members, Neighbours, Friends, Family, Neighbourhood Watch etc. (The reason you would include yourself as an Alert Recipient is so that if any of your Household Members are in trouble you would receive THEIR ‘Alert’ notification as well). NOTE: Alert Recipients & Household Members can easily be changed or edited via the Main Member’s cell phone at any given time. In a high-distress crime situation the outcome and potential survival of you or your family will often depend on what can be done in the first few crucial moments. 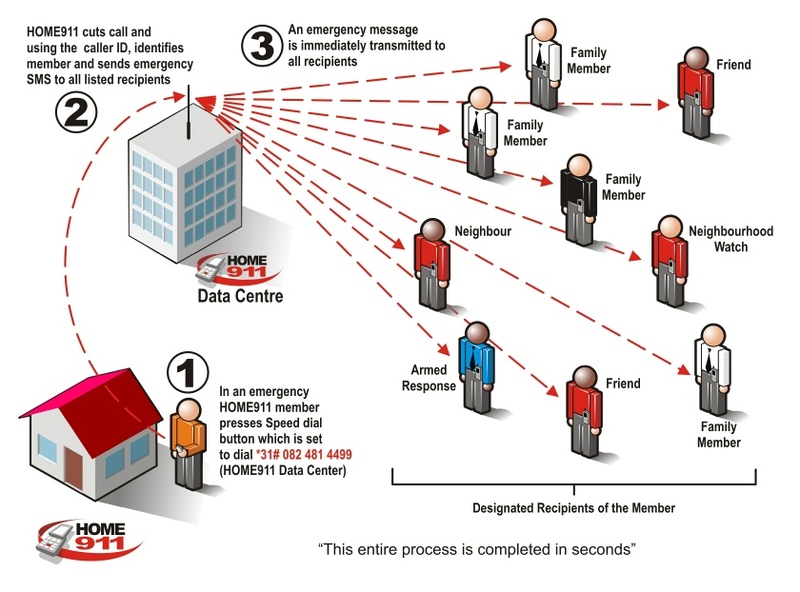 Home911 is a World-Class High-Speed Distress Alert System. 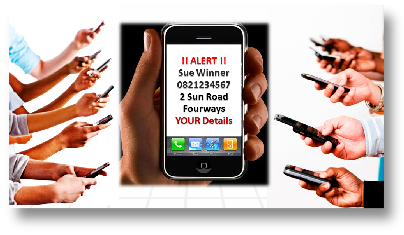 It works across all South African networks and all cell phones. YOU as a Home911 Member would simply press (for 2 seconds) or touch (touch-screen phones) ONE button on your cell phone and within seconds a High-Speed Distress Alert Message is sent to all your Alert Recipients (up to 10) alerting them that you are in trouble. Your Home911 membership also allows for up to 10 Household Members to enjoy the exact same safety benefits as you at ZERO cost. With Home911’s automated high-speed alerts there is no time wasted and your Alert Recipients are therefore able to instantly take the necessary steps in helping you or whoever else in the quickest and most effective way. Home911's automated Data Centre also automatically logs, confirms and records all Alert Notifications 24/7.